The awards ceremony and cocktail was the culmination of the clubâs fifth anniversary celebrations. Receiving recognition for longevitity in the organization as well as achievement were Joann Ballantyne, Nadine Browne, Kemran Daniel, Nadia Delpesche, Brandon Parris, Rhodeen George, Sylvorn Lewis-Harry and Helen Yammie. The sponsorsâ awards went to French Verandah Restaurant, Twilight Trading and Third Eye Security. The club also used last Saturdayâs event to hand out monetary awards to seven of its members which will go directly towards their fees for the 2012 CSEC Examinations. The recipients were Brandon Parris, Nadia Delpesche, Ronique Dowers, Javed Marksman, Shaze Yammie, Rosannia Stephens and Ariel Stephens. A special award was presented to Mary Ann Frederick, who is a member of the St. Vincent and the Grenadines Under-23 and senior teams. Founder and President of X-Ceed Sports Club Godfrey âFuzzyâ Harry was in turn presented with a surprise award from members of the five-year old organisation for his committed service. X-Ceed Sports Club, in its brief existence, mainly participates in Track and Field and Netball competitions at the national level, with some success. Some of the achievements in the past five years are their triumph in the national athletics club championship and being voted club of the year on two occasions at Team Athletics SVG Awards. 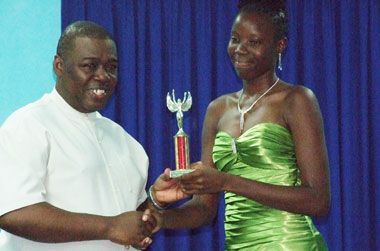 Harry also copped awards at the National Sports Awards and TASVG Awards, while Frederick was named Junior Sportswoman of the Year for 2009 and Delpesche repeated the feat for X-Ceed in the 2010 awards. Other X-Ceed club members have also featured in the TASVG Awards list over the years.